It’s creepy! It’s crawly. It occasionally has scales! 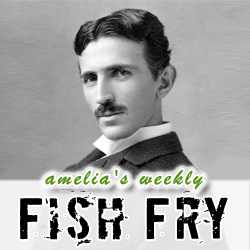 It’s Amelia’s Weekly Fish Fry! This week we are celebrating one of the coolest (and one might say, creepiest) scientists, electrical engineers, and visionaries the world has ever seen — Nikola Tesla. My guest this week is physicist Heidi Baumgartner. She can run a nuclear reactor, she can teach soldering, and most importantly for today’s broadcast, she is one of the founders of OneTesla. Heidi is here to explain exactly how you can build your very own singing Tesla coil, how she became involved with OneTesla, and what it’s like to vacation at Chernobyl. Also this week, we check out why 8-bit shouldn’t be thrown out like last year’s Halloween candy.